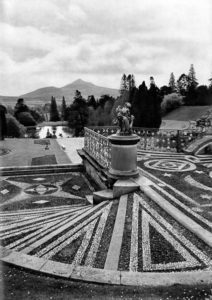 The dramatic vista that Smith portrayed is perhaps one of the strongest photographs in the book that ensued, evoking both the beauty and grandeur of the Irish countryside and the great tradition of formal garden landscaping. 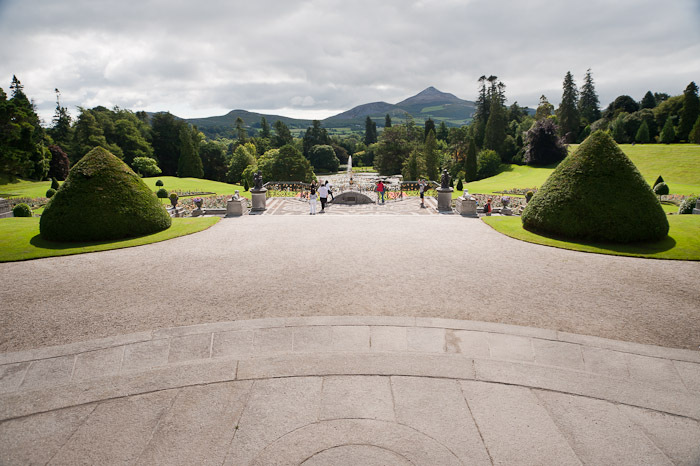 The garden was designed by Daniel Robertson in 1830 for the 6th Viscount Powerscourt. In her accompanying description of the photograph Olive Cook noted that, according to Christopher Hussey, Robertson ‘a brilliant but dissolute character’, was one of the leading proponents of Italianate garden design, which was influenced by the terraces and formal features of Italian Renaissance villas. 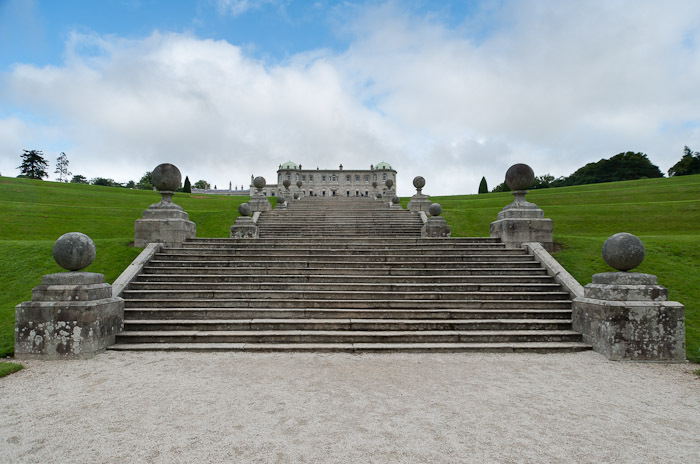 He designed the terrace nearest the house but the work ceased when the 6th Viscount died in 1844. It was not until the 1858 that all the terraces were completed, using a combination of Robertson’s designs and those of other landscape architects. Robertson is said to have suffered from gout and directed operations from a wheelbarrow, fortified by a large bottle of sherry. When the sherry was finished, work ceased for the day! The enormous scale of these terraces may be seen in these views, taken from the bottom terrace looking back towards the house (left) and from the base of the first flight of steps in front of the house, looking down (right). * def: ‘an outside platform, with steps leading to it’.